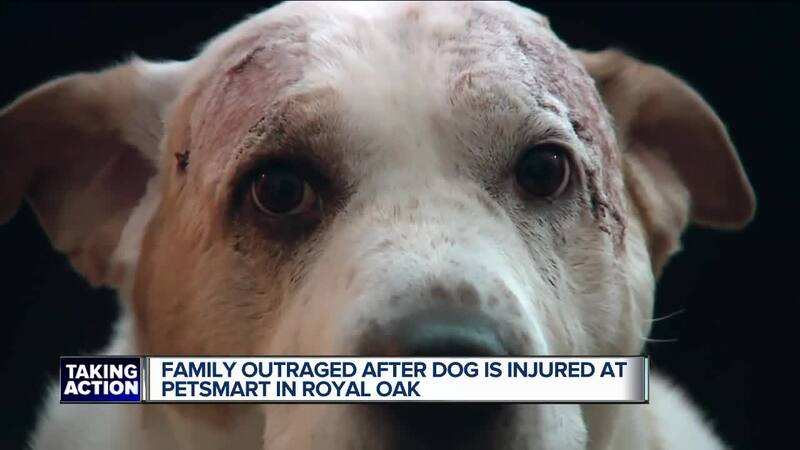 A family believes management at PetSmart in Royal Oak, Michigan, is giving them the runaround when it comes to providing answers on how their 8-year-old Shar Pei mix, Coco, was injured Monday during a grooming appointment. "I really believe, with all my heart, they're lying," said JoAnn who asked us not to use their last name. JoAnn and her daughter, Andrea, said that they were first told Coco injured herself inside a kennel by banging her head. PetSmart transported Coco to a local veterinarian who treated her for open wounds on both sides of her head, near her eyes. Coco's family said her injuries look like she was involved in a fight with another dog. On Tuesday, JoAnn said they were told a different story - that Coco was injured when she fell off a table. JoAnn said management told her she could not see the surveillance video because it was not protocol. PetSmart said they fired the grooming associate who did not properly restrain Coco. When we asked for details on the improper restraint, Erin Gray, PetSmart's Senior Corporate Communications Manager, wrote in a statement: "The associate improperly tethered Coco to the outside of a kennel door. The close proximity to the door allowed Coco to hit her head on the latch and hinges." Gray said they can confirm that Coco never fell off a table. She added that they will show the family surveillance video of the incident later this week. Coco is continuing to recover at home. Andrea said, "I just want them to realize what they've done wrong and to try to prevent it from happening again."